First Double header for this season and Yes, Both the matches provided the entertainment people waited for without any fringe of doubt. Rajasthan Royals just scampered through as Delhi hit a panic button in the end and self destructed themselves to hand Royals the first win of this season. One Man Show, Say it batting bowling or Fielding, It is pollard who won the match for Mumbai Indians single handed. Ms Dhoni came so close but a leap from 6.7” giant kept him short from crossing the winning line. – When Rahane scored his first boundary, He has scored 100 boundaries in his IPL Career. – 45 runs scored by Rajasthan Royals in the powerplay overs is the highest in Feroza Kotla. – Out of 66 innings played by Rahul Dravid in IPL, he has gone past Minimum 20 runs in 40 occasions, that’s something you call Mr. Dependable. – Rahul Dravid scored his 8th IPL fifty, and also he is the second oldest to score a fifty in IPL. Oldest came from Adam Gilchrist. – 65 runs scored by Rahul Dravid is also his highest Score in IPL Career. – Rahul Dravid played Ranji trophy with Roger Binny and today he played IPL Cricket with his son Stuart Binny. – Kevon Copper’s Wicket picked up by Ashish Nehra is his 50th IPL wicket. – This is first time David Warner has taken 49 deliveries for hitting a six. – 44 ball fifty by David Warner is also the slowest IPL T20 Fifty. – 4-24 by Umesh Yadav is the best figures for him in IPL Career. – Tendulkar’s Golden Duck was the second time in his IPL Career, first was Vs RCB last year. – Ankit Rajpoot picked up his first wicket IPL Career and its none other than former Aussie World cup winning captain Ricky Ponting. – David Warner scored the 100th Boundary of this season of IPL. – When Ambati Rayudu mistimed an Off Cutter to third man and it rested in the hands of Dirk Nannes to give the First IPL wicket for Ben Laughlin. – Dwayne Smith wicket is also the 50th IPL wicket for Ravichandran Ashwin. – 38 balls faced by Kieron Pollard is the highest ever in an innings in his IPL Career. – Both Murali Vijay & Ravichandran Ashwin played their 50th Game in IPL for CSK. – Suresh Raina played his 82nd game for CSK, highest ever by player representing a club. – MS Dhoni scored the 10th IPL Fifty. – 24 balls fifty by MS Dhoni is the second fastest in his IPL Career, Previous was Vs MI which he scored in 20 balls. – Only 2 times out of 10 times MS Dhoni’s fifty has gone in Vain, previous occasion been in 2011 against RCB. – This is also the 4th time in IPL; CSK has lost their first match of the season. DD 183/4 in 20 overs. RCB 166/9 in 20 overs. DD WON THE MATCH BY 17 RUNS. RCB certainly need a good start from their openers, which is always provided bu Kallis and Pandey. Today wasn’t an exception as both put on a very good partnership of 71 runs for the first wicket. Kallis departed for 27 to a very good delivery from Mishra. Shud i call this a twist of the game….? That’s how it looked, just bcos it triggered a huge collapse in the RCB, within the space 2 overs, array of wickets were down and RCB collapsed to 90/4 losing their top 4. Surely shud mention the bowling of Delhi, as they really bowled to the field and didnt allow Bangalore to bring the runrate down. Just to mention Kohli, Morgan tried to do something but it wasn’t to be… Ending 166/9 in 20 overs, which meant they fell short of 17 runs. 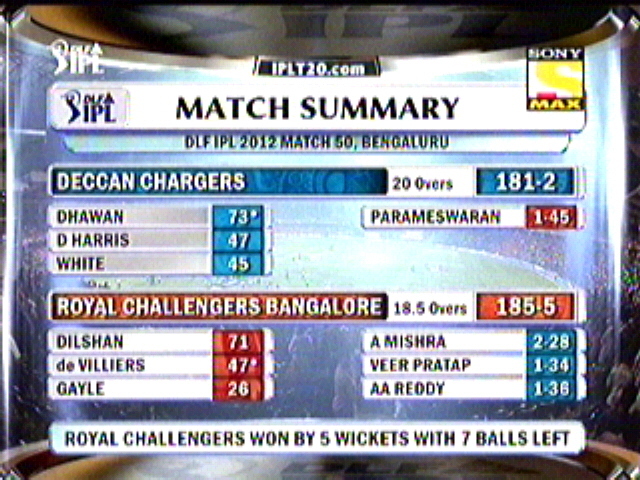 Bangalore lost their 2 match of this season and Delhi put a hold to their losing streak. CSK 180/2 in 20 overs. MI 184/5 in 19 overs. MI WON THE MATCH BY 5 WICKETS. Chasing a score of 181 is tough for any team but as i have already mentioned in the beginning, its easy for this team, with the glimpse of Sachin, Bravo, Pollard and young indians Tare, Tiwari…. Its shud be a chase able one 8 out of 10 times. Tendulkar and Dhawan started the things good, and with the help from CSK’s bowling, scored came faster than expected, and Dhawan’s aggressive mood got past them 63 in the powerplay overs. And finally CSK broke the partnership just b4 the strategic timeout. Jakathi being the bowler, and very next over, Spin Maestro Murali sent back Tiwary for just a couple… CSK felt they were right back in the game. Is this the twist we are looking for….? Not so, Just bcos Sachin along with Pollard, and bravo made sure they get past the winning rope safely. Not to mention the bowling performance of CSK, the worst ever seen in the IPL so far… If some had counted the no.of Full Toss they bowled, Pls let me know, i ll add up in the interesting facts… None other than Murali was convincing for a T20 game… Hope Venkatesh Prasad and Stephen Fleming had a point to note in their Black book…. – Both Pandey and Kallis have scored 4 times 50+ scores. Which is the highest as of now. 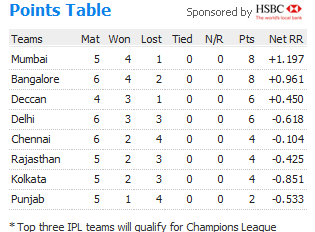 – RCB lost their first game in home for this season. – Raina scored his 6th IPL fifty. – This is the 7th 100 runs partnership scored in IPL 3. – 142* is the best 3rd wicket partnership in IPL history, previous best was 121. – Badrinath scored his 4th IPL fifty. – 142* in 91 balls is also the second highest ever scored in IPL history. – S.Dhawan scored his 5th IPL fifty. – This is the first match were a wicket hasn’t fallen in the form of a catch in the first innings. – when Tendulkar is in 39, he went past jayasuriya (778) who was the leading runscorer for MI. Now Sachin leads with 811. – Tendulkar scored his 6th IPL fifty. – 72 is the highest ever score by Sachin against CSK, which is also the highest ever scored by sachin in a T20 game. – 181 is the highest ever score chased by MI. Orange Cap – J.Kallis (310) followed by Sachin Tendulkar (248) and Virender Shewag (198). A very important game for Mumbai to be in the contention of semi finals spot. Sachin won the toss and decided to bat first, After a failed opening order in the last game, Mumbai switched back to Jayasuriya to the opening slot with bravo. But Bravo didn’t last for long, as ever morkel drew the first blood for chennai. Bur Sanath showed his aggressive intent very clearly, as he went after Tyagi, for couple of sixes. but bowler had the last laugh in the end of the over, as he was dismissed for quick 30. Later Duminy joined Tendulkar to keep the things going for Mumbai, they were 70/2 in 10 overs, But as when they are back from the break, what else u expect a wicket and yes, its Sachin this time. Nayar joined his position with JP Duminy with a 65 run partnership which really gave some respectable score fro Mumbai to bowl at. Nayar was reprieved once by Skipper Dhoni himself when he was in 16, missed a easy stumping chance of Raina. In the end two more wickets fell just to get one more extra run every time. Finally Mumbai Scored 147/5 in their 20 overs. Bowling was just good for chennai, good job by Raina and Murali, as they kept their economy rate below six and kept the batsmen guessing all the time. Needing 148 to win, As we have seen 9 times already, Parthiv (who came in place of Murali Vijay) became the 10th victim to be out in the very first ball. Not the start Chennai would like to have… As this happened, v could see hayden has started playing so slow, he waited for the balls to reach him and played pretty ODI natured game. Raina, who came in, just had two sixes so fast and went back soon.. Then badrinath joined him, in first 10 overs, Chennai were 56/2, which means, they needed 92 to win the last 10. Seems , chennai has relaxed a bit lot than expected, As usual another wicket was down after break time and badri walked, and Skipper joined Hayden, after a long period of time hayden started throwing his bat and walked over the pitch, and as did so , he signalled the end for Mumbai. Both Haydos and Dhoni scripted a empathic win over Mumbai, pulling down the screen for Mumbai’s semi’s hope. Bowling was good enough, but we have to put the blame on the captaincy of Sachin, who bowled Kulkarni’s 4 overs (which wasn’t necessary at all), which was very expensive and allowed hayden to be back in the touch. Few options in choosing the bowling looked so silly and in the end Mumbai paid the price for it. 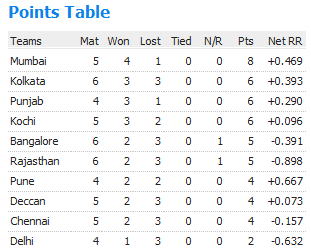 Second consecutive year, Mumbai was out in the league stage. 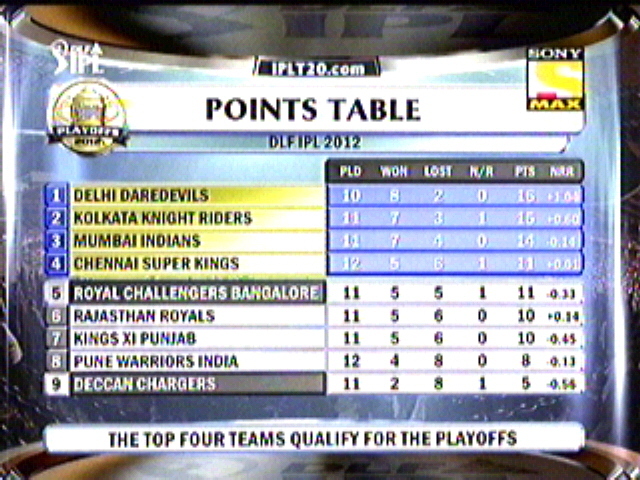 Its a game fro pride for KKR and a must win for DC for semi’s. KKR brought Masrafe mortaza back to squad, played his first game for this IPL season. Gilly won the toss and decided to chase, KKR started off well, McCullum puts a ball out of the ground to start off. But he was out so soon. Ganguly had few good shots but really his watch wasn’t working and he couldn’t time anything coming to him, looked so rusty and failed to connect the ball to its merit, to say he has been a debt for KKR in this innings, he played 41 balls to get his 33 runs. (sorry Dada its a T2o game) In came, Hussey, who showed what the T20 game is and how to play it. Man he was staggering and at his best nick, finally out by run out, it seems thats the only way he could have got out. Good Show from Hussey and Hodge got KKR to 160, which really looked as a good score in this track. Bowling Ryan Harris , Andrew Symonds and Rohit Sharma had success and bowled pretty decently, but in the depth bowling they faulted and which let the score to move up. For semi’s Deccans. need to win this game, Gilly and Gibbs went out to make the mark and leave it easy for the players in the end… They did start really well, Gilly fired some superb sixes, which sailed over the fence, but its hussey again who gave the breakthrough and gilly was caught in the deep mid wicket. Then gibbs gone after the break trying to bring down the run rate. By the end of 16 overs, DC needed about 43 runs in 4 overs with 8 wickets in hand, they mortaza took symonds with a gr8 run out of a no ball, and all of a sudden, KKR pumped up and felt tat the can win the game and came so close to a superb win which wud have been their second, Needing 21 to win last over McCullum gave the ball to Mortaza and it didnt start well as he bowled a no ball (since only 3 fielders r inside the circle) and he cudnt held the nerve at the important time and gave away all the runs needed (5+NB, 1, 1, 6, wide, 2, 4) , needing just a single in the last ball… What on the world Mortaza things no one cud know, he bowled a short ball when evry1 is inside the ring saving single, even fine leg is inside, which means even an edge would have got the runs…. Nothing to blame a lot, All to say, KKR doesnt have any Luck to win the game, eventhough u have 99% effort u need that 1% luck to take u thru…. Sorry KKR u didnt have it this time… Its Rohit Sharma the Hero of DC won the game for them with a fabulous game of 32 just of 13 balls… Hats of to him and a deserving MOM. I have to feel sorry for McCullum, Man, how much this man does, but nothing goes his way or for his team, He was so tensed when the first ball of last over called as No Ball, we cud see the heated argument between him and umpires, which show how badly he wants this game…. May be he shudn’t have chosen Mortaza for last over, any one cud have bowled and things cud have been different. But all lost is lost… Hope Atleast they have a good IPL season 3. Top two teams so comfortable for semi’s berth… rest two places is open for other four to grab…. – Hayden also becomes the first player to cross 500 run mark in this IPL season. – 26 Extras given by Mumbai is the Highest ever given by any team in this IPL Season. – Hayden scored his first boundary in 13 over. – Parthiv patel became the 10th batsmen to be dismissed of the very first ball of the match. 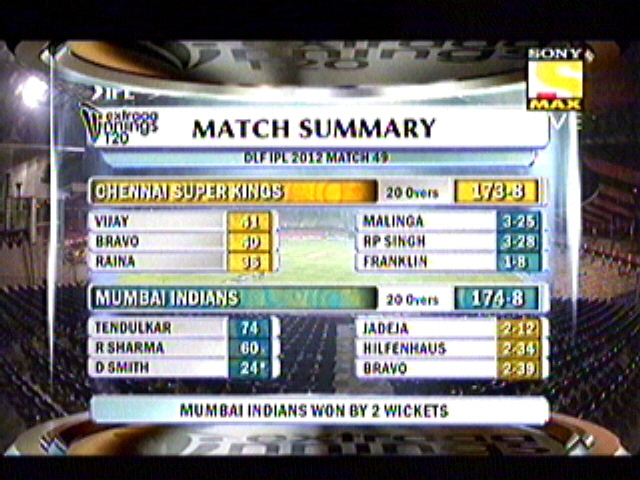 – For both Chennai and Mumbai 10 over 5th ball yielded the wicket, Sachin for Mumbai and Badrinath for Chennai. – RP singh became the first bowler of this season to be removed from bowling attack bcos of two waist high no balls. – Economy-rate of 5.60 by Suresh Raina is the best by a Chennai bowler in this season. – 400th six was scored by Sanath Jayasuriya.